ITI Fitter, Electrician, Mechanic Diesel and other trades under Apprenticeship ACT 1961 at its offices, Rigs, Installations, Workshops in Dehradun and Kolkata of West Bengal. 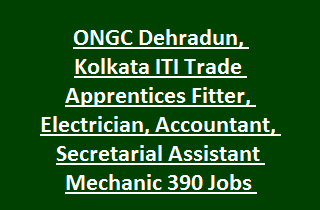 There are total 390 vacancies available in this ONGC Dehradun/Kolkata ITI Trade Apprentice Recruitment 2019. Eligible candidates submit your application along with all supporting documents on or before 28/03/2019 to the ONGC Dehradun/Kolkata. This ITI Trade Apprentices recruitment 2019 Notification of ONGC Dehradun/Kolkata will be based on merit in qualifications only. Trade wise vacancies, age limits, Educational qualifications and other details of ONGC Dehradun/Kolkata Recruitment is given below. Vacancies available in Oil and Natural Gas Corporation Limited (ONGC): 286 posts. 2. Mechanic (Motor Vehicle): 03 posts. 3. Cabin/Room Attendant: 11 posts. 8. House Keeper Corporate: 15 posts. 9. Instrument Mechanic: 03 posts. 10. Store Keeper: 05 posts. 12. Electronics & Mechanic: 07 posts. 14. Secretarial Assistant: 116 posts. 15. IT & ESMT: 24 posts. 17. Chemistry Lab Assistant: 08 posts. Monthly stipend will be as per Government rules. For ITI Trade posts candidates must have qualified in their respective trade. For Secretarial Assistant, Account Assistant 10+2 qualification is required. For Chemical Lab Assistant B.Sc Degree with Chemistry and Lab technician certificate is required. Candidate Age limit should be between 18 years to 24 years as on 28-03- 2019. Candidates will be shortlisted based on their educational qualifications in respective trade. Those short listed candidates only called for documents verification and interview. Apply online for this ONGC Apprenticeship through official website of www.ongcapprentices.co.in. Last date to reach the application form to ONGC Dehradun and ONGC Kolkata is 28-03-2019 by 05:00 PM. Application form and Notification for ONGC Dehradun Apprentices Recruitment. Notification and Application form for ONGC Kolkata Apprentices Recruitment.